We had the chance to capture Justin & Kelly's wedding this September. We met Justin & Kelly when we taped Justin's sister's wedding the year before. It is always fun to with people you know and appreciate the importance and power of video. This video was created for Kevin & Nicole. Their DVD was taylor made for both Kevin and Nicole in mind, each with their own menu and with their own video. It is a great way to tell their wedding story in two different ways. Here is a screen shot of their motion menu. This video was created for Kevin & Nicole. Their DVD was taylor made for both Kevin and Nicole in mind, each with their own menu and with their own video. It is a great way to tell their wedding story in two different ways. Here is a screen shot of Nicole's motion menu. This video was created for Kevin & Nicole. Their DVD was taylor made for both Kevin and Nicole in mind, each with their own menu and with their own video. It is a great way to tell their wedding story in two different ways. Here is a screen shot of Kevin's motion menu. A little different than Nicole's. The Preparation Highlights captures all of the details of behind the scenes of the wedding day preparation. This video was created for Kevin & Nicole. Their DVD was taylor made for both Kevin and Nicole in mind, each with their own menu and with their own video. It is a great way to tell their wedding story in two different ways. This was Nicole's Preparation Segment. It was a more slow and romantic approach for covering the preparation. A bit of a switch from Kevin's Preparation video. A Post Ceremony segment covers the time between the ceremony and reception. This video was created for Kevin & Nicole. 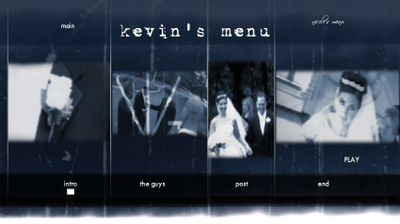 Their DVD was taylor made for both Kevin and Nicole in mind, each with their own menu and with their own video. It is a great way to tell their wedding story in two different ways. 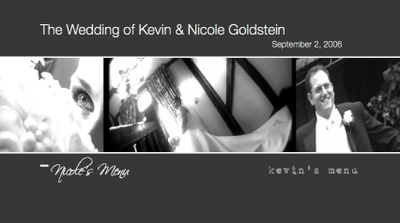 The Post Ceremony piece was the same for both Kevin & Nicole's part of the video.